This title was first published in 2002: The best way to avoid losing at an employment tribunal is to make sure that you don't get drawn into one. 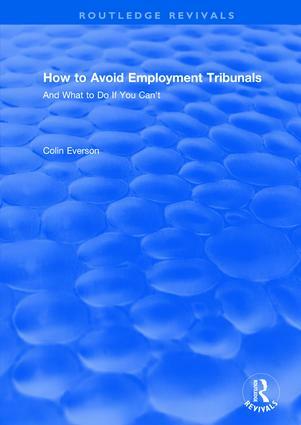 The author offers a practical training resource to help you understand the risks associated with employment tribunals, identify risk areas within your organization and, most important of all, provide you with the means to raise awareness amongst both managers and their employees and help them develop good people-management practice. At the heart of the resource are three compelling training case studies on unfair dismissal, racial discrimination and sexual discrimination. This resource also provides you with material to audit your current management practices and identify where and how to improve them.